I subscribe to the school of thought that you should always try everything once–in terms of food exploration, that is. If you don’t like it, fine. But then you should try it again sometime down the road. Often your likes and dislikes change and something that you might have disliked a year or two ago might turn into one of your favorite foods! This is what happened with me with the anchovies and capers. I wouldn’t necessarily say they’re my favorite foods, but I can say that I’m not grossed out anymore and I thoroughly enjoy recipes with these ingredients. The capers need to be rinsed before being used and this really tones down the acidic, vinegar-y flavor. They’re mild–trust me, please! Since you only use 2-3 anchovy fillets, the salty flavor is mild and when you make this recipe the anchovies break down into almost a paste so there are no big chunks! The flavors amalgamate to form a robust, salty, light coating on the spaghetti and there is no one flavor that stands out more than another. It’s as if these ingredients were made to be together! Just try it! Also, the grated Parmesan cheese on top really mellows out the flavor as well…how’d I do?? I have a feeling I piqued your interest a bit and you’re contemplating trying this recipe out….do it! Put on some salted water to boil for your pasta and cook according to directions on the box. Make sure not to overcook the pasta. Mushy pasta=gross. In a pan, heat up a good amount of olive oil over medium heat. Toss in your chopped garlic and cook for a few minutes, always being careful not to let it burn! Throw in the anchovy fillets and break them up with a wooden spoon or whatever. Toss in the rinsed capers and let it sit over low heat. Pretty much you’re infusing the olive oil with the anchovy flavor so that it coats the pasta when you combine it. 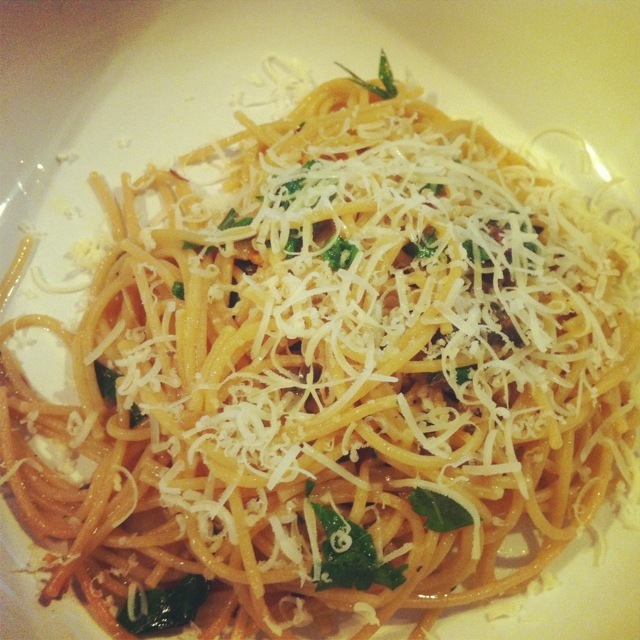 When your pasta is done, toss in the chopped parsley to the anchovy pan and combine the sauce with the pasta. Dress with the parmigiano and enjoy! I make a version of this with ground walnuts added, yum! This is one of my favorite recipes from one of my good friend who also has a food blog. She is also from Italy-Miami. Whatever that means. She made me this super cheap and easy recipe when I went to visit her few months ago. The only thing I added is breadcrumbs on top of the spaghetti just to absorb the extra olive oil. Oh and some dry red pepper.